It's hard to bet against the Athletics. Their special brand of discovering value in unlikely places has led to some surprising performances. When GM Billy Beane started spinning off stars like Jeff Samardzija and Josh Donaldson, everyone saw a rebuild in progress. Instead, Beane pivoted yet again. The club is well positioned to contend in a difficult AL West. While the team isn't oozing depth, they have some redundancy. The versatility of Ben Zobrist, Marcus Semien, and Brett Lawrie will open a variety of paths for a midseason upgrade. The rotation and bullpen should be sound if not elite. The Athletics rotation features good depth, but they lack a standout ace. Fantasy owners are drafting Gray like he's a legitimate number one – 89th overall - but his profile is lackluster. Last season was representative of what we should expect with a 3.08 ERA, 7.52 K/9, and 3.04 BB/9. His ERA will probably increase a small amount. The issue is with his two fastballs. The four seamer and sinker are solid pitches with 94 mph velocity, but they allow a lot of early count contact. The result is the low strikeout rate. On the positive side, this helps him to pitch deeper into games. He's a better fit for H2H leagues where K/9 is less important. Kazmir and Hahn are both late draft value picks. Kazmir takes a kitchen sink approach with six pitches. His best are a changeup and curve. He posts similar surface level numbers to Gray with a 3.55 ERA, 7.75 K/9, and 2.36 BB/9. Dig beneath the surface and it becomes clearer why he's available over 150 picks after Gray. Simply put, his pitches are easier to square up than those of Gray. Even after two consecutive healthy seasons, he should be viewed as a modest injury risk. Hahn is one of my favorite pitching targets this draft season. With an average ADP around pick 290, he offers top 100 upside in an affordable package. Reports have put his spring velocity around 94 mph – up a couple ticks from last season. His fastball was his worst pitch last year, so a little extra zip would be welcomed. He has a good sinker, plus-plus curve, and he's still developing a slider and change. The final spot in the rotation belongs to either Drew Pomeranz or Jesse Chavez. Pomeranz appears to be the frontrunner although Chavez may be the better fantasy option. Pomeranz is a lefty with a three-pitch repertoire of fastball, sinker, and curve. The shallow repertoire profiles better in relief. Chavez has a five pitch mix including three different fastballs. The cutter is a plus, but the sinker and four seamer aren't particularly good. The A's acquired Chris Bassitt as part of the Samardzija trade. For now, he's minor league depth. He could be a spot starter later in the season. Doolittle is sidelined with a partially torn rotator cuff. His rehab has just progressed to throwing baseballs, so he'll probably be out until late-May at the earliest. The lefty is a useful closer when healthy, but a shoulder injury is always scary. While he's out, Clippard will lock down the ninth inning. Clippard usually leads the league in holds, and he closed for the Nationals in 2012. His fastball, changeup, splitter repertoire allows all three pitches to play up. The result is plenty of punch outs and weak contact. Not only does he strikeout between 25 and 30 percent of hitters (10.49 K/9 in 2014), he also induces a high infield fly rate. The result is a free out from roughly 40 percent of hitters. He is climbing draft boards, but remains underpriced. Apparently satisfied with the outfield, Beane acquired a new infield for 2015. There is no Donaldson in the group, but Ike Davis, Billy Butler, Zobrist, Semien, and Lawrie could outperform the 2014 squad. When hidden from left-handed pitching, Davis remains a potential monster. His power declined precipitously over the last two seasons, but he also dealt with nagging injuries. It's a make or break year for him from a power perspective. The A's intend to platoon him with Billy Butler. Davis is available after pick 400, while Butler isn't even first base eligible in some formats. Semien, Zobrist, and Lawrie are all multi-position eligible in most leagues. That flexibility makes them solid core players for fantasy owners. Semien is still developing as a hitter, so expect some bumpy play. If and when he breaks out, he's a potential five category contributor. He has enough pop for 10 to 15 home runs with 10 stolen bases. He might be too patient at the plate. 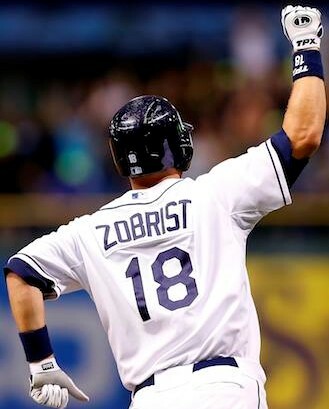 Zobrist isn't the same fantasy monster he was in 2012, but he still offers solid value. There's no reason he can't replicate his 10 home run, 10 steal 2014 with solid run production. He'll continue to hit in a prominent position in the lineup. There are decent alternatives around his average ADP of 156. He's a good pick if you need flexibility and modest five category production. Most, including Lawrie himself, hope that a move from the Rogers Centre artificial turf will rejuvenate his career. The former top prospect has failed to deliver on the promise of his 2011 rookie campaign. His development is perhaps a cautionary tale for Mookie Betts owners (personally, I'm not concerned). Last year, a high infield fly rate dragged his average down, but it was injuries that really ruined his season. The result was a .247/.301/.421 line with 12 home runs in 282 plate appearances. The 25-year-old stopped running last year, but he stole nine bases as recently as 2013. The upside could include 20 home runs, 10 stolen bases, decent run production, and a tolerable average. The downside is another injury plagued year. Available around pick 225, there are worse upside plays. The outfield is heavily platooned, which makes Coco Crisp, Sam Fuld, Craig Gentry, and Josh Reddick better fits for owners in shallow leagues who can stream from the waiver wire. The A's are the eighth team in our power rankings. The club is marked by depth and versatility. There are value picks aplenty with Kazmir, Hahn, Clippard, Semien, and Lawrie leading the pack. Only Gray appears to be overdrafted. Oakland should be among the contenders for a wild card slot this season. It will take a little luck to oust both the Angels and Mariners from atop the AL West. However, they're better situated to deal with injuries and improve via midseason trade.